In the past I have purchased barbells, kettlebells, medicine balls, a prowler sled and bumper plates from Fringe Sport. Every time, the customer service has been outstanding, shipping has been fast and usually free and the equipment is high quality. You may pay a little bit more, but you get what you pay for. In my opinion, their equipment is top notch for putting together a home gym and this Fringe Sport hex bar continues in that tradition. I’ve had my Fringe Sport Hex Bar for a little over 2 years. The hex bar, also known as a “trap” bar, gets its name from the fact that the bar is actually shaped like a hexagon. 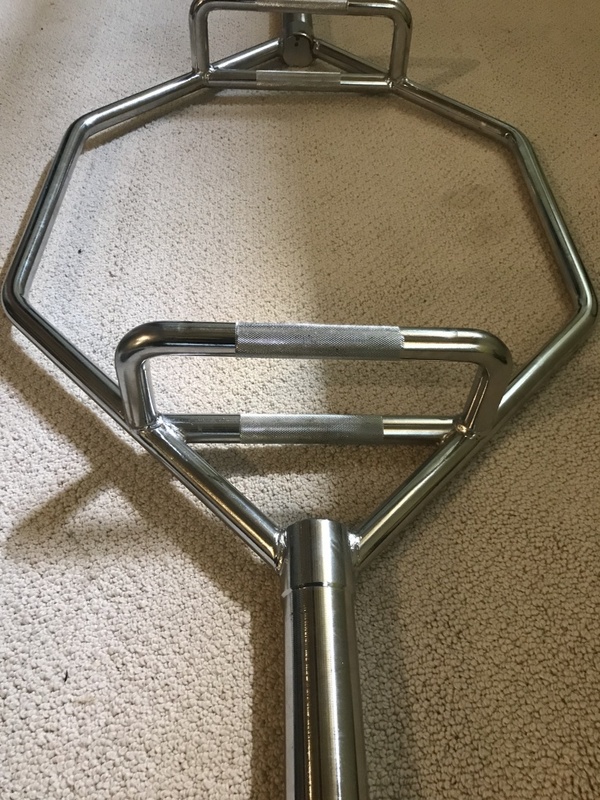 My Fringe Sport hex bar cost me $239 which is kind of high when compared to bars by Titan and CAP Barbell, but not as expensive as the hex bars that Rogue has to offer. My bar had fast and free shipping, so that has to be taken into consideration when thinking about price and you also have to consider the quality of the equipment. I also received a free set of super strap collars with my purchase, which usually cost $29.00. A co-worker of mine tried to save a few extra bucks and bought a less expensive barbell from another company. He got about a years’ worth of use out of the barbell and one day he loaded the barbell up and it broke. I never have to worry about that happening with any of my Fringe Sport equipment, most of which my family and I have been using for the last four years. The hex bar weighs in at 50 lbs, has a weight capacity of either 300 lbs or 600 lbs. There is some confusion as to the weight capacity because the Fringe Sport website specs indicate that it has a 600 lb weight capacity. However, according to a response to a question about the hex bar on the Fringe Sport website, the weight capacity is 300 lbs. If you are planning on putting 300 lbs or more on this bar, I would check with Fringe Sport directly. Editor’s Note: We checked with Fringe, and this one they rate at 600 lbs. They used to sell Troy’s hex bar that they referred to in a Q&A response as being 300 lbs, but Troy’s website indicates that theirs is 600 lbs also. They appear to be identical. The hex bar measures 56 inches long, 23.375 inches wide, and 5.25 inches high. 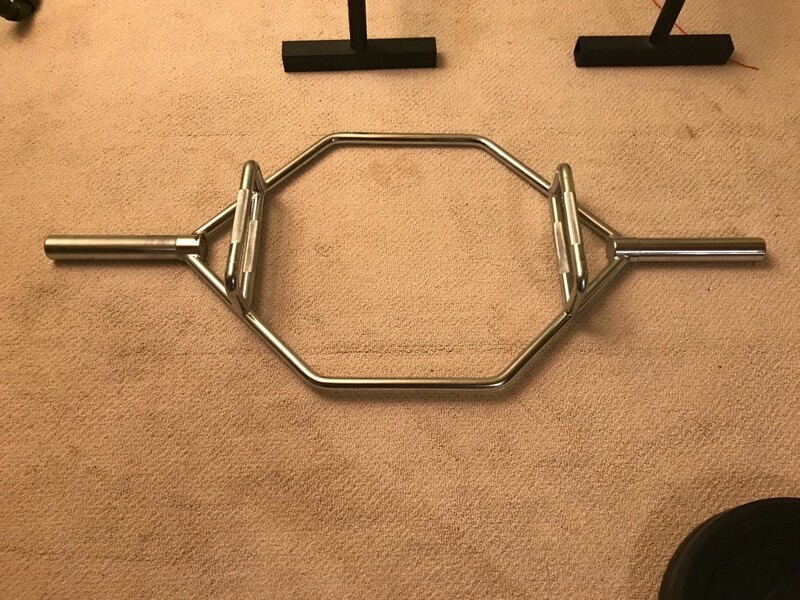 The hex bar is made out of steel and has a chrome finish which makes it resistant to rust, which was important to me because the bar is stored in the basement (winter months) or the garage (summer months) and may be subject to condensation of some sort. There are two handle options, one flush with the sleeve on either side and one directly above the handles that are flush with the sleeve on either side. There is medium knurling on both handles. The medium knurling gives you enough friction to lift heavy without ripping up your hands. I have lifted between 210 lbs and 220 lbs doing deadlifts and did not have any grip issues. I will probably never come close to the 300 lb or 600 lb weight capacity so I can’t comment on how well the knurling will serve you at weights in that range. While listening to the Tim Ferriss Podcast episode that featured Ryan Flaherty, “The Savant of Speed,” I discovered that doing hex bar deadlifts can have tremendous benefits for athletic performance. Ever since l listened to the podcast, I have incorporated the hex bar in my training. For those of you who are unfamiliar with Ryan Flaherty, he is the Senior Director of Performance at Nike. Prior to holding that position, Ryan was the Founder and President of Prolific Athletes LLC, a sports performance facility in San Diego, California, where he trained some of the world’s best athletes. Ryan developed an algorithm called “Force Number” that is based on the hex (or trap) bar deadlift and body weight to predict speed such as the forty-yard dash. Here is a link to the podcast. I use the hex bar primarily for deadlifting. I will load the weights on to the bar, step into the hexagon and get to work. I use the handles that are closest to me when I step into the hexagon. 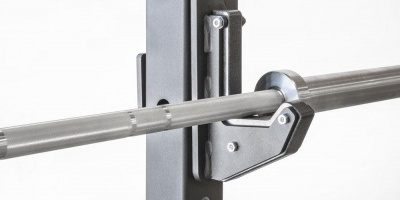 Fringe Sport describes their “trap bar” as the ideal bar for beginners in the powerlifting world and they suggest that it is perfect for performing deadlifts and heavy shrugs. While my main focus with the hex bar is to do deadlifts and farmer’s carries, it can easily be used to do shrugs. Deadlifts and farmer’s carries are most beneficial for my obstacle course race training. My Fringe Sport hex bar gets used at least once a week as part of my training regiment. I think the hex bar is a worthwhile investment when you are putting together a home gym. It’s durable and versatile and dependable. 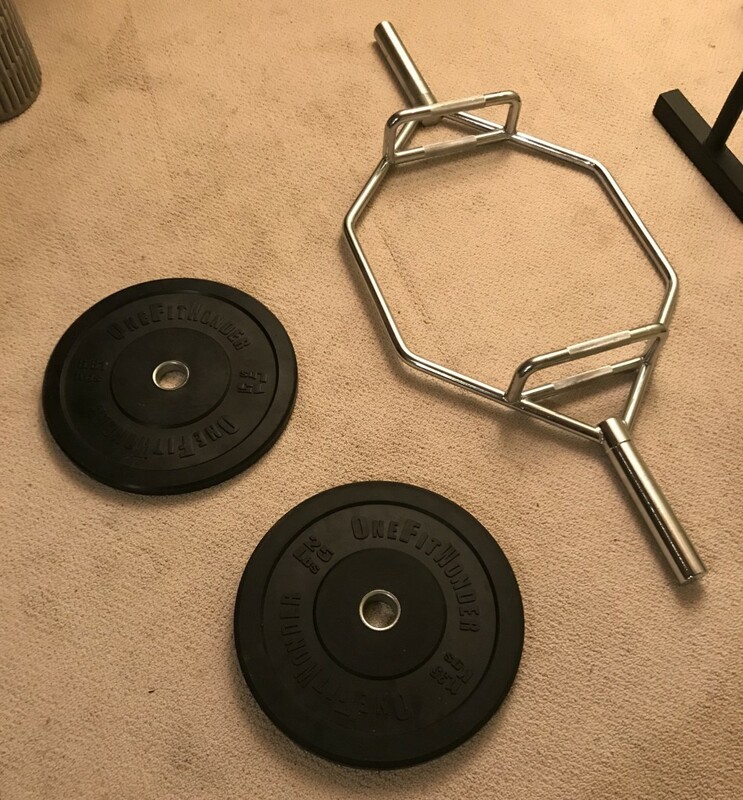 Although Fringe Sport suggests that the hex bar performs best using metal plates, I have been using the Fringe Sport OneFitWonder bumper plates without issue. Editor’s Note: We featured these bumpers in our article about steel inserts in some bumpers coming loose. Fringe is one of only a few companies who utilize an anchoring system on their inserts to completely prevent that from happening. When I first started putting together our home gym, I knew we would need to get bumper plates and barbells. Fringe Sport was offering fast and free shipping, which was hard to pass up. We purchased a set that included two of the following: 10lbs, 15lbs, 25lbs, and 45lbs. I felt bad for our delivery people because it seemed like we were getting something really heavy other week while we were putting together our home gym. I don’t recall what the packaging was like when we received the bumper plates because we have had them since 2014. The set we purchased did smell like rubber for about a week or two, but once we started to use them routinely, the smell went away. I think using them outdoors helped reduce the amount of time that they smelled like rubber. 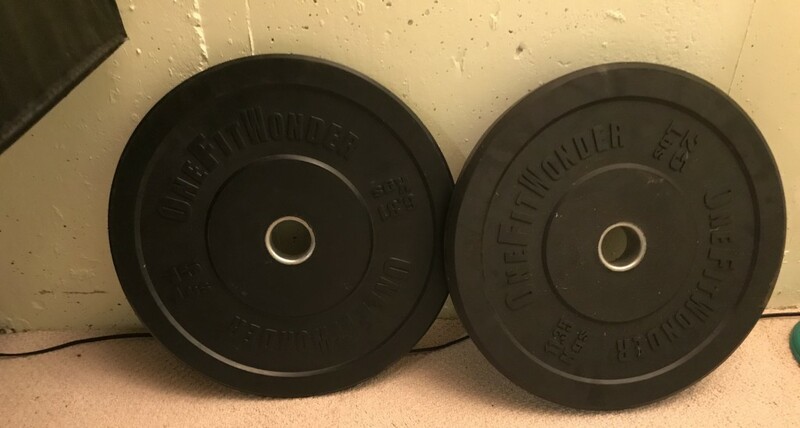 The bumper plate widths are: 45’s – 2.9″, 25’s – 1.87″, 15’s – 1.2″, 10’s – 1.05.” The bumper plates have the following durometers: 10’s and 15’s are 90 sHA; the 25’s and 45’s are 85 sHA. The bumper plates are made out of Virgin rubber which allows them to be thinner and have stainless steel inserts. The bumper plates have their weight marked in lbs as well as kilograms. We use our bumper plates with 2 different barbells, the hex bar, and a prowler sled, all of which we purchased from Fringe Sport. The bumper plates all have the same diameter and they can be loaded onto all of the barbells, hex bar and prowler sled without issue. The bumper plates fit very snug on the barbells, hex bar, and the prowler sled. The bumper plates do not rattle around on the barbells or the hex bar, but I would suggest that you use some type of collars as a safety precaution. Because the bumper plates are made out of Virgin rubber and are thinner, this allows you to load more weight onto your bars. We use our bumper plates quite frequently, a few times a week in our home gym (the basement, the garage or outside). Because of where we use our bumper plates, we generally do not drop them because we don’t want to damage our basement floor or our garage floor or mess up the yard too much. As such, I can’t comment on dropping these bumper plates. However, Fringe Sport posted this video to their website (scroll down) that shows that the bumper plates are pretty durable even after they are dropped. In the normal day to day use in our home gym, these bumper plates serve their purpose. They are versatile, durable and dependable. 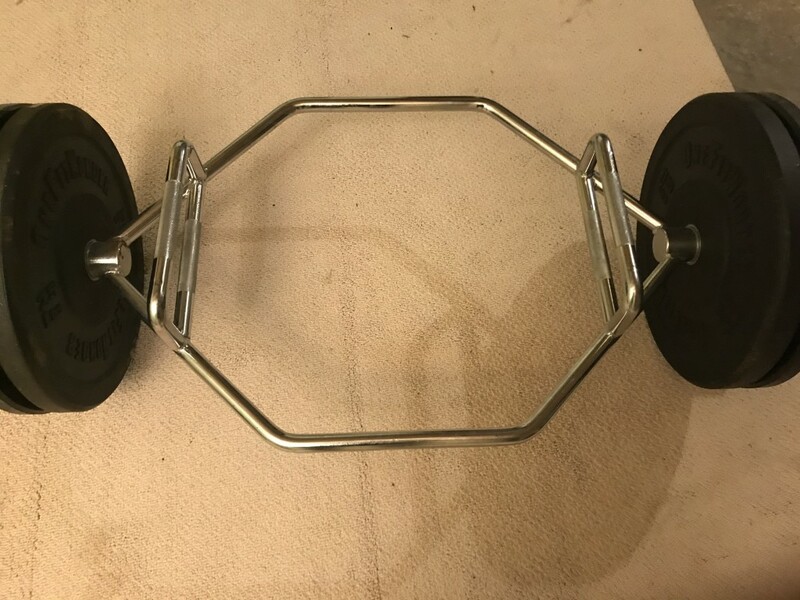 Part of the reason I like these bumper plates and all of my Fringe Sport equipment is that while it may seem like an expensive investment at the time, the equipment is made and designed to last. I’m hoping that someday when my now 11-year-old son and my 1 and ½-year-old daughter are ready to start lifting and training, my Fringe Sport equipment will be ready for them. Based on how well the equipment has aged over the past four years, I have no doubt that they will be using the same equipment from Fringe Sport that we are using day in and day out.